← Homage to an ancient postmodernist…. It’s that backwards time of year again! In astrological symbolism, Mercury represents the principle of communication in all its facets. 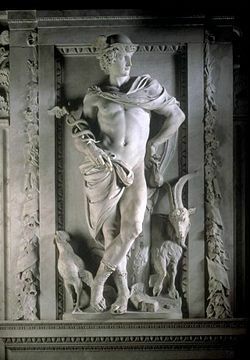 Mercury, quicksilver Greek god of communication and travel – isn’t he gorgeous?! In the spring, summer and autumn/winter of each year, the planet Mercury does something strange. It appears to slow down in its orbital pace, stop, then start to move backwards. This is known as retrograde motion. It is of course an illusion. Otherwise, we’d have fallen off the solar system aeons ago. I learned to look forward to having some rest during Mercury Retrograde, since my referral rate dropped. Normally clients always turned up for appointments, MR periods being the exception. Cancellation rates increased. Once, a client called to cancel because her house had just caught fire (yes, she called the Fire Brigade first! ).Two clients often turned up at the same time. Cheques invariably got lost in the post, or clients forgot to bring cash. One summer I moved office during MR, becoming involved in a dispute of byzantine complexity with the telephone company which took almost a nervous breakdown to sort out. As MR periods approached, I used to entertain my students by looking at their individual horoscopes, which enabled me to be more specific regarding possible MR effects. I told one student, a lawyer, that a female helper in his workplace was likely to have communication problems which would impact on him. His feedback? His secretary sprained her wrist, and was unable to type during the entire MR period. Mercurial people, eg writers, are those most affected by Mercury’s retrograde phase. What can we writers do to maximise advantage and minimise disruption when Mercury is retrograde? As a general principle for all of us, writers or not, Mercury Retrograde is a positive time for going back over all matters to do with communication, and cleaning up. Some examples: if you’ve been putting off a purge of your filing system, do it now. If your accountant has asked you nine times for your last year’s papers, use this 2-3 weeks to update them. Dig out and finish some of those half-worked articles. Use MR times for reminder letters to editors. If you’ve been writing furiously and the brain/wrist is seizing up, have a break. Catch up with some reading. As we know, fallow time is creative. The don’ts? If it is not feasible as a working writer to avoid or delay taking new initiatives or completing existing processes, eg sending out new proposals and submissions or signing contracts, leases, etc, try to accept complications or thwartings philosophically. Also – be prepared for delays, eg when travelling, especially long distance. Don’t sit under the mailbox waiting for cheques. And please, don’t arrange for a phone installation! Retro 24/11/11, Direct 14/12/ 2011. This entry was posted in 05 - New Posts: October 2011 onwards, Astrology Article Archive 1 – "Not the Astrology Column" and tagged astrology, Astronomy, communication, Earth, horoscope, mercurial, Mercury, Mercury Retrograde, planet, Praxiteles, Solar System, writers' craft. Bookmark the permalink.